The Google team has always had a knack for answering questions and John Mueller is no exception. This Google Webmaster Hangouts features someone asking John Mueller directly if Google+ affects rankings, how video spam is increasing, how Google is handling rich snippets, social media and much much more. Apparently, there are slideshow “videos” appearing in the search results now. (People are making automated slide show videos, embedding them on their page and having it pop-up as a video result in the results.) Google doesn’t seem to be aware of the situation… but it could it be the next blackhat way of increasing your CTR? If anyone has a way of automatically generating a video by combining text, pictures on a page, let me know! Is buying Twitter shares and Google+ followers against T.O.S.? John says that there is nothing in place to check this right now but they’ll likely be doing something about this in the future. Should we no-follow social media widgets? John Mueller says “I don’t know“… but let me tell you, I have seen people getting positive results by doing so. So yes, I would recommend having no-follow on any outgoing social media link plugins. John Mueller says that it takes time for Panda to refresh! Up to 6 weeks because it needs to re-crawl your entire site and then re-asses the quality of it. In our tests, we’ve been able to have much faster Panda updates (possibly because we’ve been getting our sites crawled faster). “If you re-write your content… you’ll see a benefit from it“. I have to interject here as well. “I can’t write all the content for my items. What should I do?“. “It is too much work to write unique descriptions“. If your team consists of 1 person (yourself), and you have an e-commerce store with 2000+ items… then something is wrong. Imagine you had a physical store. How in the world would you manage that! Bottom line is: Have unique content! Google has an “original content” algorithm that tries to determine the source of content on the web. They often get it wrong… but try not to. If they get it wrong, you’ll see the wrong article pop up in the search results. It is REALLY annoying to have Google determine that some other scraped version of your content is original while your site gets outranked by scrapers. I think this is the most annoying thing in the world of search. Our tests show different (in the members section) results. In fact, we’ve seen significant changes with SSL modifications so is John lying? Perhaps misleading? Maybe ONE algorithm does not use SSL but another one does? You’ll notice that our site is currently running SSL. He mentions you might want to look into HSTS if you’re thinking of moving to https and make sure that you use rel=canonical with the new https addresses. If Google can crawl billions of pages, index all the content of the world, maps, etc. Then why the hell does it take so long to re-index a disavow list? John: “Errrr, yeah.. mmm… we’re working on it“. John also shares with us a bit on how Google works. 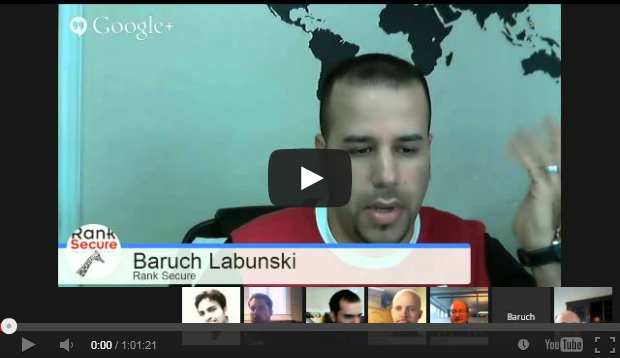 Does Google+ impact search rankings? Is is a ranking factor? As if we haven’t confirmed this enough. John Mueller confirms this ONCE again on the Google hangout (35 minutes in). “You shouldn’t use Google+ for rankings, but instead of spread the word about your site. Don’t use social media to rank higher, use social media to tell people about your site“. Rightttttttttt. Although I completely agree with his message, I find it hilarious that he basically says: “Don’t use Google+ to manipulate rankings!” which implies that IT DOES affect rankings. Not that you didn’t know this already. What did you think about this month’s webmaster hangouts? Are they great at avoiding direct answers or what! Regardless, they are a great of way of gaining insight on what Google is doing (and thinking) so I’d like to thank John Mueller for hosting them. See ya on the next hangout!